Security forces on Sunday killed two local Hizbul Mujahideen terrorists in an overnight encounter in Kashmir while the third surrendered, making it the first case of arrest during a gunfight in several years. The encounter had started on Saturday evening in Barbugh area of Shopian district after specific information about some terrorists hiding in the area, police said. During searches, the hiding terrorists opened fire at the security forces who retaliated, leading to a gunfight which continued till this morning, a police spokesman said. 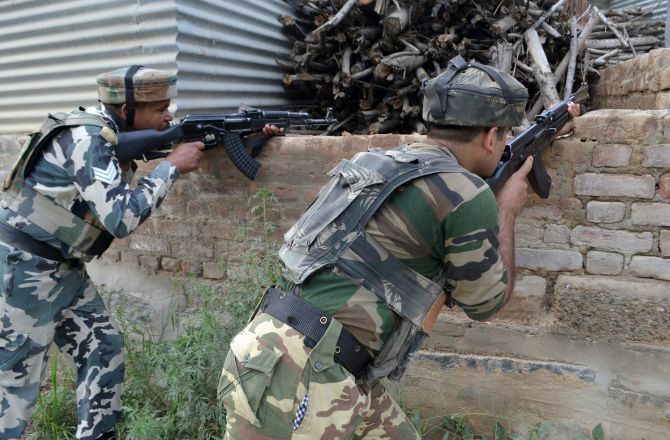 "Two terrorists were gunned down in this encounter who were identified as Altaf Ahmad Rather and Tariq Ahmad Bhat. One terrorist identified as Adil Hussain Dar surrendered before the security forces," he said. Dar, who became first terrorist to be apprehended alive during an encounter in several years, had reportedly joined Hizbul Mujahideen just about four months back. The gunned down terrorists were involved in attack on SPO Khursheed Ahmad Ganaie, the spokesman said. Tariq was involved in the attack on security forces' convoy at Chakoora in Shopian, the spokesman said. Tariq was also involved in attack on SI Gowhar Ahmad Malla at Barbugh and in the bank robbery at Turq Wangam.